Samsung's Memoir is a full touch-screen mobile phone equipped with an 8-megapixel camera and other multimedia features. Among the features of the new iPhone, expected to be announced next week, may be a video camera and if so, it joins a growing pack of mobiles to include video-recording capabilities. Plenty of BlackBerrys — the iPhone's main competitor — can shoot video, including the BlackBerry Storm, Curve 8900 and the Bold 9000. The long-awaited Palm Pre, due to go on sale Saturday, will not include a video cam, according to a company spokeswoman. The ability to take, not only watch, videos on cell phones is becoming more important as a YouTube generation uses their mobiles to either send short video clips as a multimedia message, or to post them the popular video-sharing site. "You always have a cell phone on you, and even a Flip (camcorder) is a bit too bulky to carry in your pocket at all times; it generally goes into a bag of some kind," said Avi Greengart, consumer devices research director for Current Analysis. "The other advantage a cell phone has is built-in connectivity. While a Flip makes sharing or uploading a movie a simple process, you still need to wait until you can dock it with a PC. With a cell phone and a data plan, you can share or upload immediately." Still, you won't find the kind of image resolution and quality, frames-per-second rate and optical zoom on phone video cameras that you will on dedicated camcorders. "High-end (video) camera phones top out around 640-by-480 (pixels) at 30 frames per second, but even that is still quite rare, and none have optical zoom or high-quality glass lenses," he said. "At the other extreme, high-end camcorders can take high-definition digital video good enough for a low budget Hollywood film." In general, a guide to resolution numbers, according to Greengart: "320-by-240 is roughly VHS resolution, 640-by-480 starts to approach DVD resolution and 720-by-480 — often called “high definition” for video-recording purposes — is equivalent to widescreen DVD," with true high-definition TV being either 1280-by-720 or 1920-by-1080. "If you’re recording for YouTube, 320-by-240 is fuzzy but quite common, and 640-by-480 is more than sufficient," he said. "If you’re recording for playback on an HDTV, anything less than 720-by-480 will look blocky or blotchy." Storage, too, is another issue, with video files taking up lots of room, which can become a precious commodity on a mobile phone. "On a phone you might want to use a chunk of that memory card for music, photos, contacts, or applications, while the camcorder is used mostly just for video," Greengart said. "And then there’s battery life: at the end of the day, if your camcorder battery runs out in the middle of nowhere, you can still use your phone to call a cab. If your video recording session drains the battery on your cell phone, you’re stuck without a phone." But for those who want to leave the full-featured camcorder, or even the Flip, at home, there are some phones that can do the job when it comes to video, as long as you don't mind compromises. The N96 provides digital image stablization for video recording — a great idea when you're shooting video with a device weighing only 4.5 ounces. Also unusual is the N96's video settings for scene, light, white balance and color tone. The phone, which includes a 5-megapixel camera, has a dual LED camera flash and video light. The phone comes with 16 gigabytes of internal memory, and another 8 GB can be added with a microSD card. It has a 2.8-inch display screen. Up to 90 minutes of video can be recorded, depending on resolution. Samsung Memoir. This phone is most known for its 8-megapixel still camera (Samsung recently announced a 12-megapixel camera phone, the Pixon, due out in the United States later this year; it will capture video at the same resolution as the Memoir). The front of the Memoir very much looks like the camera that it is, with the lens prominently featured, rather than tucked in the back of the device, akin to what many cell phones manufacturers do. But the Memoir also has video recording in three different modes: 720-by-480 at 30 frames per second, 640-by-480 at 30 frames per second and 320-by-240 at 120 frames per second. The higher frames per second rate means you can capture some fast action at a sporting event, although at 320-by-240, the video quality won't be terrific. Still, the faster frames-per-second rate is a nice option to have. "While it's definitely not the same quality you'd get from a true video camera, it's quite do-able and won't give you a headache to watch," wrote WirelessInfo.com in a recent review of the Memoir. Samsung says users can record video for up to 60 minutes, depending on the resolution that is used. The Memoir is carried by T-Mobile, which is advertising it online now for $199.99 after signing up for a two-year contract, receiving a discount and a rebate. LG Dare. The Dare has three video recording modes: 640-by-480, 320-by-240 and 176-by-144, and can shoot 30-second clips for uploading to the Web, or hold up to an hour's worth of video, according to LG. 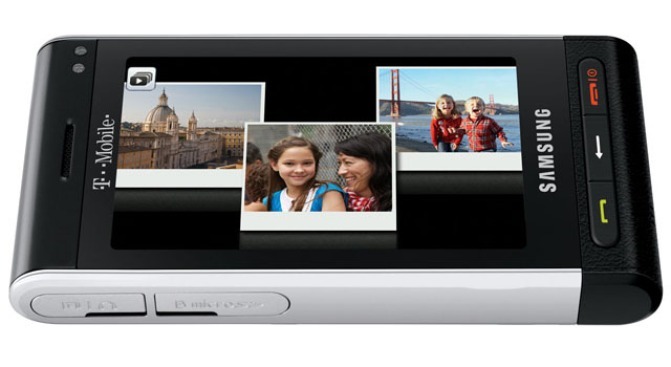 It has 128 megabytes of built-in memory, but a Micro SD High Capacity (SDHC) slot holds up to 8 gigabytes of storage. The Dare, with a 3-inch touchscreen, also includes a 3.2 megapixel still camera. It is sold by Verizon Wireless, and costs $169.99 with new activation and a two-year contract. Motorola MotoZine ZN5. If you're a fan of Kodak, you may like this phone which includes Kodak's 5-megapixel still camera as well as video capture. Video resolution is not terrific — either 176-by-144 or 128-by-96 at 15 frames per second. Motorola says the phone has up to 350 megabytes of internal memory available, but also has a slot for a microSD card of up to 4 gigabytes. The ZN5 was recently priced by T-Mobile as $349.99, but is free after a rebate and signing a two-year contract with the wireless carrier. HTC Touch Diamond. This is one of the smallest smartphones on the market, weighing less than 4 ounces, with dimensions of 4 inches by 2 inches, and less than a half-inch thick, and and it also includes a video camera and 3.2-megapixel still camera. Some may feel that might make the Touch Diamond a little too touchy for dealing with video controls on the phone, which is a highly regarded product. Short video clips can be captured at these resolutions: 352-by-288, 320-by-240, 176-by-144 and 128-by-96. Internal memory is 4 GB, and there's also a microSD card slot that can hold up to 16 GB of memory for extra storage. The Touch Diamond is available at either Sprint or Verizon Wireless, with pricing varying from $199 to $299, depending on discounts, rebates and contract length. A new model, the Touch Diamond2, is due out in the coming months.